Once cited as proof—by no less than the boss of EA Sports at the time—that Madden NFL in fact had competition, the free-to-play browser-based sports management game QuickHit NFL is done for good as of the middle of next month. Bought out by Majesco a year ago, the QuickHit operation declined to renew its NFL license in June. Now a posting on the game's Facebook page says the entire game will be shut down on Aug. 17. "We have determined that it is in everyone's best interest to focus our efforts on future titles," the announcement says. Developed by a startup company headed by the former CEO of the MMO-maker Turbine, QuickHit had a strong run from late 2009 into 2010, when it secured a league license allowing players to outfit their created teams as any of the 32 in the NFL. 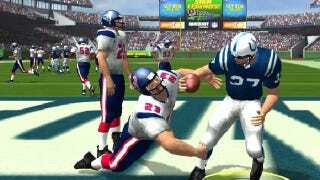 QuickHit never got an NFLPA license, though, which would have put the likenesses of real NFL players in the game. QuickHit NFL focused on player management and development more than it did on in-game action (whose outcomes were often the visual representation of a dice-roll). but it did acquire a cult-ish user base in its time. Now it is moving on to other ventures. "[We] hope to see you playing our next game, Mini Putt Park," the game's handlers said.